If you love massacres or are just a big fan of underdog stories that don’t make a turn for the better, then you will love tonight’s division rivalry Thursday Night Football game between the Cleveland Browns and the Baltimore Ravens. This is a true David vs. Goliath story; the only difference is that this one will end up with David’s head rolling around on the floor while Goliath celebrates by doing the Ray Lewis dance. The Browns are coming into the Ravens M&T Bank Stadium at the most inopportune time. The Ravens are coming off their huge and emotional Sunday Night victory over the universally hated New England Patriots. 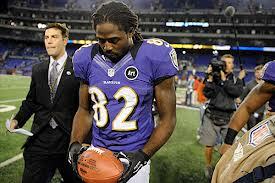 While there was yet another controversial call by the Replacement Refs to end the game in which the Ravens game winning field goal appeared that it may have been just wide, the real story of the game was the emotional triumph of Baltimore’s wide receiver Torrey Smith. Smith’s younger brother died in a tragic motorcycle accident on Saturday and in a last minute decision, Torrey decided to play the game in his brother’s honor. Smith ended the game, which was played against one of the leagues best teams, with an amazing and heartfelt 127 yards and two touchdowns. While I never root for the Ravens, being an AFC powerhouse on a consistent basis, I was truly cheering for Smith that entire game. He is a real class act. Oh! Don’t worry about the Replacement Refs botching another call tonight because guess what? Ding Dong the Rent-a-Refs are gone! The league has come to terms with a news agreement for the Real Refs. Watch here for more news on that. While Cleveland is one of the only two remaining winless teams left in the NFL, the New Orleans Saints being the other, they still have a lot of hope for the future. No realistic Browns fan came into this season thinking that with a rookie running back and quarterback that they would be a success right off the bat. The Browns current roster is the true definition of a work in progress. 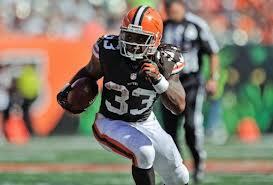 While Trent Richardson has shown signs of future stardom, his PIC, Branden Weeden is yet to have his breakout performance. Sorry Cleveland fans, you will have to wait at least another week to see that happen because Ray Lewis and company have built their careers off of eating rookies and inexperienced players for breakfast. Oops! Next weeks game is against the New York Giants. Even if the Browns had a team filled with veterans, the Ravens would still have a clear advantage in this game based solely on the fact that the Ravens have dominated the Browns for 8 straight contests. On top of that, Joe Flacco has been at the helm for each of those lopsided victories and is off to the best start of his young career. The Browns have averaged just over 11 points a game during that losing streak to their division rivals and tonight’s game should be right around those same numbers…maybe worse. The one advantage that the Browns might have, if you are looking really hard for the silver lining, is that the Ravens are one of the oldest teams in the league and now they have to play on a short 4 days rest. In all honesty, I feel that if the Ravens had a double header against a bye week rested Browns team, Baltimore would still come out victorious, so to me the rest really doesn’t matter. To add salt to their wound, Cleveland has a few injuries that will make the final score of this prime time game even more lopsided. The Browns #1 wide receiver, Mohamed Massaquoi, will be sidelined with a hamstring pull and veteran back up Tight End, Alex Smith, will be out with a concussion. On top of those injuries, Trent Richardson, the one bright spot of what has been a nightmarish start to the season, has a banged up knee and while he is listed as probable to play I doubt he will be effective. On the opposite side of the spectrum, the Ravens have a completely healthy team and their star player, Ray Rice, is coming off his most impressive game of the season where he had his first 100 yard game of the year and a touchdown. I am expecting that between Ray Rice dominating the clock with his fearless power running and Joe Flacco picking apart the Browns extremely porous defense, this will look more like a scrimmage during training camp between the starters and the third stringers. While I would never wish the big “Doughnut” season on anyone, I feel that the Browns have a good chance of being winless this season. 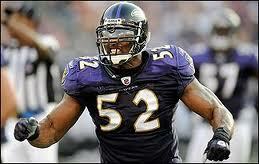 My prediction for tonight’s massacre is a Baltimore victory, 34-7. Sorry Cleveland, at least you still have the Rock and Roll Hall of Fame. 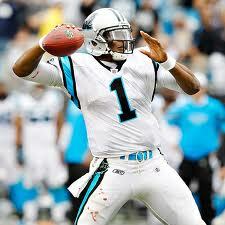 You’re damn tootin’ we like Cam Newton! The NFL regular season is around the corner and teams are getting their rosters in order. 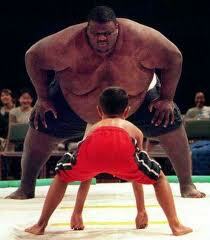 It is never easy to succeed as a rookie in the NFL and it is even harder to do so as a Quarterback. Last season was proof that you really can rebuild a team around a rookie QB, as was evident with how Cam Newton took the football world by storm and brought the Carolina Panthers back to relevancy. As of noon this morning, 4 different teams have announced that they will be starting a rookie quarterback during week 1 of the NFL season. Andrew Luck (Colts), Robert Griffin III (Redskins), Brandon Weeden (Browns), and most recently Ryan Tannehill (Dolphins) were all named opening day starters for their respective teams and all the pressures of the NFL world have been placed on their shoulders. A fifth rookie, Russell Wilson (Seahawks), is slated to start for the first time in Seattle’s third preseason game, but I feel that when the regular season roles around, the Seahawks Free Agent pickup, Matt Flynn, will be their starter. In this article, I will break down how each of the 4 starting rookies will pan out over their freshman season. Never has the expression “big shoes to fill,” rang more true than it does for Andrew Luck and the man he is replacing. Former Indianapolis QB, Peyton Manning, is one of the best of all time and now Luck has the unfortunate privilege of following his legacy. Luck was drafted as the number 1 overall pick of the NFL draft and is off to a sizzling start to his first ever preseason. Just 2 games into the preseason and Luck already has a couple of passing touchdowns along with a rushing TD which definitely is not his forte. If you’re counting, that’s 3 more touchdowns than the entire Jets team this preseason. While he has already been picked off twice, the poise and comfort he shows on the field has been impressing everyone. With the former Stanford star player so well in preseason and at training camp, NFL analysts are picking his beneficiaries in the receiver positions as some of the better fantasy options for the new season. With Reggie Wayne looking healthy and determined to prove he can succeed without Peyton and Austin Collie trying to make the 2012-13 season a healthy and improved one, Luck has options to help him along the way. Andrew’s former college teammate, Tight End Coby Fleener, was also drafted by the Colts and is looking like he can be a formidable option for Luck to build stats off of. 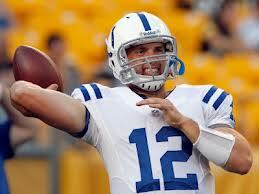 Luck’s got the size, skills and fortitude to succeed right away in this league and I think he will do just that. 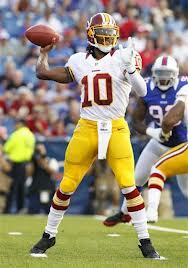 Unlike Luck, RG3 doesn’t have a predecessor that is even worth mentioning. What Griffin does have though is the comparison of last season’s break out rookie sensation Cam Newton weighing down on him. I have said from the get go that while Luck is without question the better prototypical QB between him and Griffin, I feel that RG3 will lead his team to more wins this season. RG3 not only won a Heisman Trophy with Baylor, he absolutely demolished all of their school’s records with his ridiculous athleticism. While Griffin is significantly faster than Newton, his lack of size can cause him some trouble at the professional level. The Washington Redskins coach, Mike Shanahan, seems to have the perfect offense for RG3 to excel in and since Griffin has a better arm than Newton does, expectations coming into this rookie campaign are uncomfortably high. Griffin has 3 great targets for him to choose from with veteran Santana Moss, free agent acquisition Pierre Garcon, and feisty Tight End Chris Cooley spreading the field. Since Shanahan still hasn’t confirmed who will be the staring tailback for the Skins this year, it’s feasible to think the RG3 can lead his team in rushing for the season. Having said that, I am a huge fan of Running Back Roy Helu, and I feel that this could be a breakout season for the second year man out of Nebraska. I think Luck will win rookie of the year but I don’t think he will run away with it because Griffin is going to have a brilliant freshman campaign as well. Browns’ gardening plans for this season: Weeden out the bad to focus on the good. Weeden is probably the least known of the 4 quarterbacks I am talking about today but that doesn’t make him the worst…although in this case it’s arguable. I say that with respect because all four of these rookies are going to have above average season’s for newbies. Brandon is replacing Colt McCoy who just never really got his game to the level that we all expected him too. Weeden is taking over a team that has been in the gutter for most of their existence, so he is probably entering the season with the least pressure out of all the rookie QB’s. Weeden does have the luxury of being the second most important rookie on his team since the #3 overall pick, Trent Richardson, will be where all eyes are looking for the beginning of the season. Richardson will be Weeden’s get out of jail free card because all of the teams failures will most likely be pointed at Trent rather than Brandon. 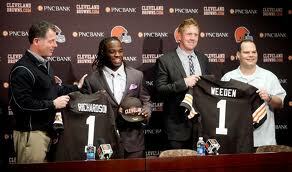 The Cleveland Browns have one of the worst Offensive lines in the NFL and Weeden will be under constant pressure. Richardson has great hands and since there really isn’t a quality receiving option other that Greg Little on the Browns, you can expect Trent to be Weeden’s go to guy. Unlike Luck and Griffin, Weeden will be replaced if he doesn’t show signs of progression early on in the season. McCoy remains on the team and will be the Browns starting QB if Weeden doesn’t find a way to make his offense work. If veteran Tight End, Benjamin Watson, can remain healthy throughout the year then he can help Brandon stack up yards on short plays over the middle. 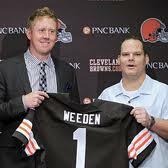 The Browns are going to be terrible once again but I feel Brandon Weeden will show signs of a quality QB in the making. Can Dolphins swim up (Tanne)hill with their rookie? With Matt Moore playing absolutely awful last season, the door was open for Ryan Tannehill to take over the QB role for the Fins. The Miami Dolphins have never started a rookie QB in week 1, but their new coach, Joe Philbin, thinks Tannehill is the man to break that streak. Not even Dan Marino or Bob Griese had to deal with those pressures, but the 6’4″ gunner out of Texas A&M is ready for the rodeo. 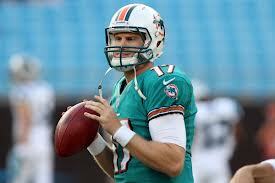 Tannehill is the first Dolphin QB drafted in the opening round since they drafted Marino in 1983. Since 83′, the Dolphins have started more QB’s than any other team in the NFL (17). While Ryan is working with one of the better Offensive lines the NFL has to offer, he is without a real quality receiving option which will make his rookie campaign a tough one. It doesn’t help Tannehill that he plays in the AFC East where there are 3 of the better defenses coming at him 6 times a season. I think that Tannehill will have a favorite target in Anthony Fasano and the two of them will connect as one of the better QB-TE combinations in the league. While Reggie Bush is an amazing athlete in the backfield, his blocking is extremely below par and could cause Tannehill to taste a lot of dirt throughout the season. Miami will not be a winning team this season but I think that starting Tannehill behind center is a good step in the right direction. Even though I feel that all four of these rookies will become successful QB’s in the NFL, I do not feel that any of them will lead their respective teams to the playoffs this season. I love to watch rookies play in the spotlight and I will be following these four young guns throughout the year.